Raymond George Herb was President and Chair, Board of Directors of the National Electrostatics Corporation (1965-1996). Other institutional affiliations included the University of Wisconsin, Madison. His research interests included electrostatic accelerators and vacuum technology. January 22, 1908Birth, Navarino (Wis.). 1931Obtained BA, University of Wisconsin, Madison, Madison (Wis.). 1935 – 1972Research Associate in Physics (1935-1939); Assistant Professor of Physics (1939-1940); Associate Professor to Professor of Physics (1940-1961); and Charles Mendenhall Professor of Physics (1961-1972), University of Wisconsin, Madison, Madison (Wis.). 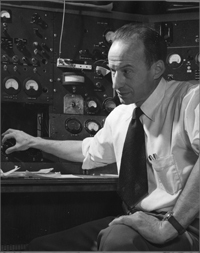 1941 – 1946Researcher, Massachusetts Institute of Technology (MIT) Radiation Laboratory. 1955Member, National Academy of Sciences. 1965 – 1996President and Chair, Board of Directors, National Electrostatics Corporation, Middleton (Wis.). 1968Awarded Tom W. Bonner Prize in Nuclear Physics, American Physical Society. Advised by Herb at University of Wisconsin, Madison, "Deviations from a pure s-wave anomaly in the proton-proton scattering cross sections between 1.4 and 2.1 Mev." Advised by Herb at University of Wisconsin, Madison, "The Resonance Scattering of Protons by Lithium." PhD advisor at University of Wisconsin, Madison, "Yield of alpha-particles from lithium films bombarded by protons." Both employed at University of Wisconsin, Madison. President and Chair, Board of Directors. Obtained BA (1931) and PhD in Physics (1935). Research Associate in Physics; Assistant Professor of Physics; Associate Professor to Professor of Physics; and Charles Mendenhall Professor of Physics. Received 1986 Tom W. Bonner Prize in Nuclear Physics. American Vacuum Society interview collection, 1991-2013. General interest session [sound recording], 1968 April 24. Gregory Breit Symposium [sound recording], 1968 May 3. Oral history interview with Raymond George Herb, 1976 April. Oral history interview with Raymond George Herb, 1982 October 8. Raymond G. Herb papers, 1938-1989. University of Wisconsin--Madison Archives. Oral History Project: Selected Interviews with Physics and Astronomy Staff and Students. University of Wisconsin-Madison Department of Physics records, 1885-1962. Alfred Olaf Hanson response to 1981 History of Nuclear Physics Survey, 1981. Oral history interview with Edward Creutz, 2006 January 9 and 10. Oral history interview with John Clarke Slater, 1970 February 23 and August 7. Oral history interview with Robert Serber, 1967 February 10. Robert G. Sachs letters concerning Merle Tuve's and Raymond Herb's physics research at Johns Hopkins University and the Univerity of Wisconsin, 1983-1984. Raymond G. Herb Physics Today obituary.